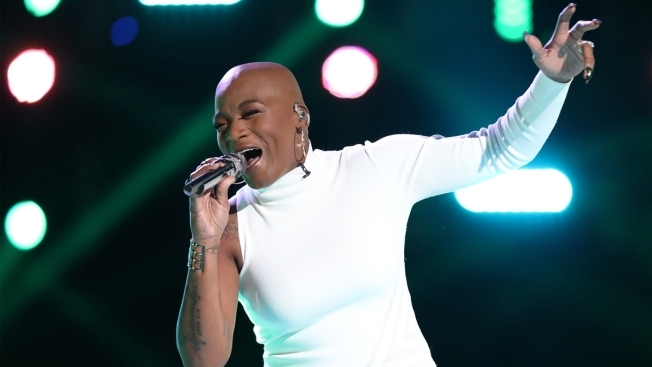 Janice Freeman, who competed on season 13 of NBC's "The Voice" in 2017, has died at age 33. The singer, who was on coach Miley Cyrus's team and reached the top 11 on the singing contest series, passed away on Saturday at her home in Pasadena, California after suffering a medical emergency. TMZ quoted her family as saying that she had told her husband, Dion, that she was having trouble breathing, after which he called 911 and performed CPR until paramedics arrived. She was later pronounced dead at a hospital. In addition to Dion, Freeman is survived by her daughter, Hannah, her child from her first husband, who died of cancer, and other family members. Her cousin, Johanna Freeman, confirmed and mourned her death on Instagram. Freeman, a native of Harrisburg, Pennsylvania, had battled many health issues through her life, including cervical cancer, bacterial infection meningococcal meningitis and the autoimmune diseases lupus and Sjogren's syndrome. She also survived kidney failure as a child. Cyrus and fellow "The Voice" coach Jennifer Hudson paid tribute to Freeman on Instagram. Cyrus posted on her Instagram Story a photo of a rainbow and writing, "Thank you @janicefreeman...for everything. This represents you perfectly." Hudson posted on her Instagram page a video of Freeman performing Imagine Dragons' "Radioactive" during "Voice" Blind Auditions. "@janicefreeman the voice of hers we got to hear and the bit of life we got to watch her live was a blessing and inspiration to us all!" Hudson wrote. "My heart and prayers go out to @janicefreeman daughter and family ! @mileycyrus@nbcthevoice#ripjanicefreeman"
Last month, Freeman posted on her Instagram page, "I want to give ALL praises to THE FATHER for this healing process! It has been a difficult, trying, discouraging, mentally draining, etc last 3 months I have had to deal with in a very long time! But God is FAITHFUL and HE is healing my body and I'm starting to see a little clearly again!... I'm so grateful and overwhelmed because HE loves me so in spite of me deserving it or not." She also talked about her health issues and competing on "The Voice" in an interview with RealHealth in 2018. "I just wanted to be able to capitalize off this platform, walk away from this, live comfortably and do the things that I've been wanting to do since I was little, namely share my music and have it be successful in all the ways that matter," she said about the show. "I want to be able to inspire people because my heart's desire is for people to have hope." She also talked about her daughter. "There's been times where I wanted to give up, and I know why God gave her to me," Freeman said. "She's taught me so many things, and for her to see me fight again, for her to see that in spite of what her mom goes through, she still stands tall and she's always pushing, for her to see that nothing--from what color she is to being a woman--can stop her, that there's nothing that she can't accomplish. That means the world to me."